The Kickstarter of the SpiderForest Coloring Book was a success and even reached two stretch goals - thank you to all who pledged for helping us get there! As I'm soon in need of a newer car, I also figured a bit of a money cushion wouldn't hurt, which is why I also opened commissions, prices can be found here and to order one you can just send an email here: sophie [at] gerritianchronicles [dot] com If you want to support in another way, there's always the Patreon, which is by the way three pages ahead of the website! 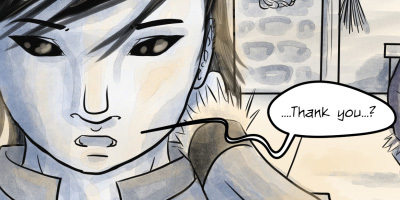 Arbalest - A monster with six months to live learns to transcend the role that a small village has dictated for her. 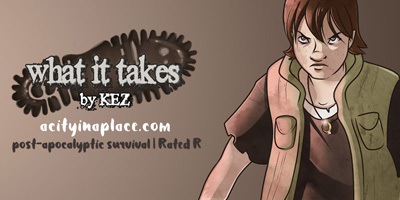 What it takes - Post-apocalyptic martial arts survival, zombie-free! Colbey survives the end of the world, but while trying to find her fiance amid the ruin, she must navigate scorned scientists, tyrannical factions, and the occasional explosives. Rated R.